We're currently on a cross country road trip from New Hampshire to Oregon and posting about sites along the way. This post is about a stop in Boise, ID. As noted in a previous post about our visit to the Madison, WI capitol, these are one of the best places to visit if you're in a state's capital city. Luckily, we were able to visit Idaho's state capital when we stopped in Boise. Boise was not Idaho’s first capital city; Lewiston was the first in 1863; Boise was the second choice in 1864. Construction of the first portion of the capitol building began in the summer of 1905, 15 years after Idaho gained statehood as the 43rd state. Architects were John E. Tourtellotte and Charles Hummel. The final cost of the building was over $2 million. Construction of the first portion and dome was done in 1912 and it was completed in 1920. It's called the Capitol of Light. The Renaissance Revival Capitol is Idaho's most significant historic structure. 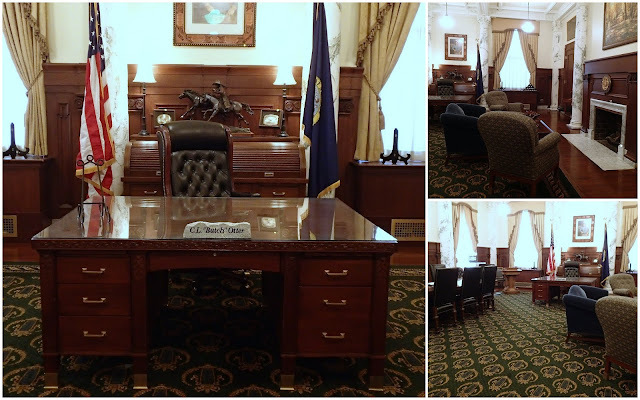 It functions as the seat of Idaho's state government, currently housing the executive and legislative branches and numerous state offices which occupy much of the approximately 190,000 square feet of usable space. Tourtellotte designed the building using light shafts, skylights, and reflective marble surfaces to capture natural sunlight directing it to interior spaces. For him, light was a metaphor for an enlightened and moral state government. 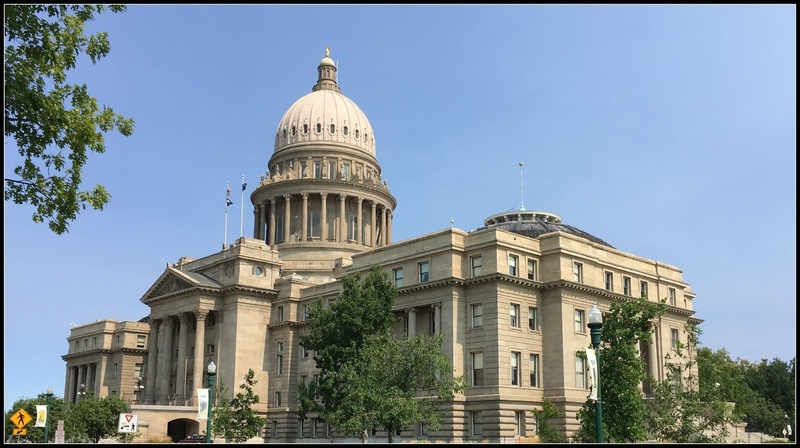 The dome of the Idaho State Capitol rises 208 feet atop the dome is a nearly 6-foot high bronze eagle.The Renaissance Revival Capitol is Idaho's most significant historic structure. It functions as the seat of Idaho's state government, currently housing the executive and legislative branches and numerous state offices which occupy much of the approximately 190,000 square feet of usable space. True marble is used in the building. White marble with green veining (American Pavonazzo) is on the columns of the central portion of the building. 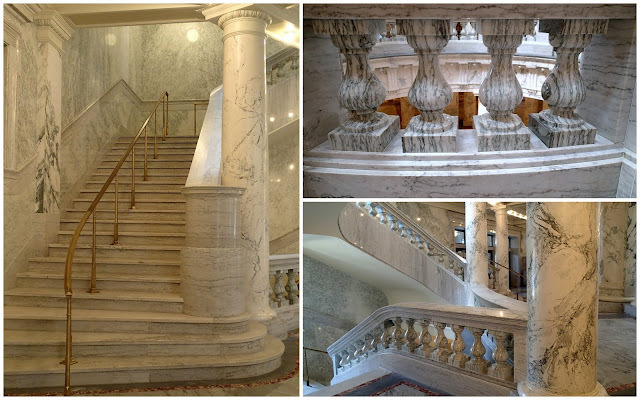 Brocadillo marble, a greenish-white marble with green veining, is on the Corinthian column wainscoting and upper wall panels of the staircases. The building has 219 pillars (Doric, Corinthian, Ionic). The floors throughout the building are comprised of four different marbles from four different quarries and locations. red marble from Georgia, gray marble from Alaska, green marble from Vermont, and black marble from Italy. Architectural inspirations were St. Peter’s Basilica, Rome, St Paul's Cathedral, London and the U.S. Capitol, Washington, D.C. The Great Seal of the State of Idaho on the floor of the central rotunda was adopted in 1891 by the state legislature. Idaho has the only state seal designed by a woman. The official state seal (which also appears on Idaho's state flag) is an update of a painting by Emma Edwards Green (of Boise City) that was selected as the design for the great seal of the state of Idaho in 1891. The current seal is an updated version commissioned in 1957. when it was colorized and streamlined, the female figure was modified and the miner's clothing was modernized. The first floor has a compass rose; the center has a sundial with minerals found in Idaho. There's a private elevator (no longer in use) outside the Legislative Reference Library. It transported judges to the Idaho Supreme Court Chamber, which was on the third floor, but is now in a new Supreme Court Building. The rotunda rises to an opening at the top of the inner dome called the oculus (eye of the dome). Although it's hard to see impossible to make out from the bottom floor. There are 13 large stars representing the 13 original colonies; 43 smaller stars, represent Idaho’s status as the 43rd state. The second floor has offices of the the lieutenant governor and the governor. The current Governor C.L. (Butch) Otter was was not in his office the day we visited. The third floor has the state's legislative offices: Senate in the west wing and House of Representatives in the east wing. The two chambers were remodeled in 1968. The fourth floor has balcony entrances to the senate and house galleries. The second statue is a replica of Winged Victory of Samothrace. Idaho received this replica from the Merci Train, which was sent to the U.S. in 1949 by France to express appreciation for supplies that Americans sent after WW II. Boxcars filled with gifts were sent to the capital cities of each state. Idaho’s boxcar included this replica of Winged Victory of Samothrace. Visitors like ourselves can take a free self-guided tour of the capitol by using a guide. It's provided in the visitor center which is located in the renovated basement of the capitol. The center features displays about Idaho history and includes a small gift shop. Capitol tours are available but need to be scheduled in advance since they are conducted by volunteers. What an absolutely fantastic building. Thanks for sharing the tour with us. What an amazing building. I must thank you for sharing your wonderful trip with us all. I am seeing things that I will probably never see for myself so it is a delight to be able to share your tour. Another beautiful building. I really liked the statues. I love this road trip. 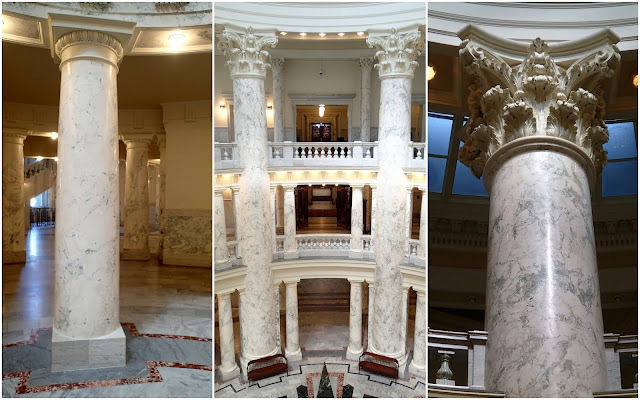 The details about the Idaho capital is amazing. 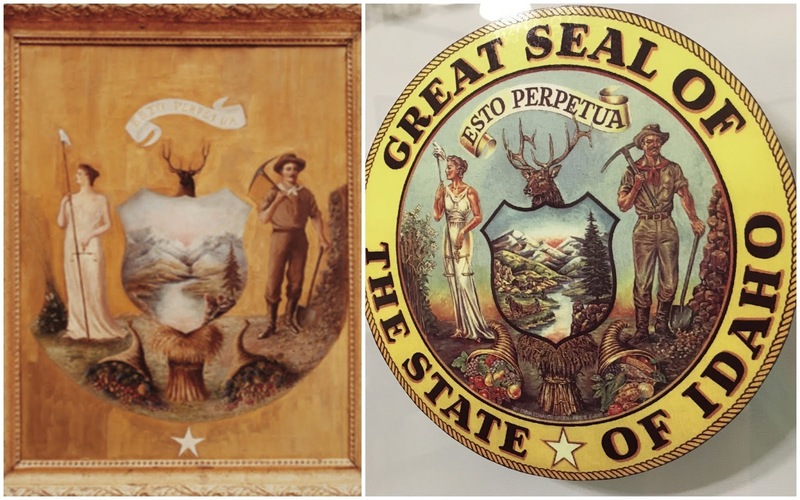 I think I prefer the original State Seal over the new version. The old version makes it more historical. I been through Boise, ID but didn't really stop to visit the city. We zoomed by it on freeway...sad but true. thank you for sharing. Great idea to visit state capitals! Nice tour. I'm always amazed at how ornate these buildings were made. They are always interesting to visit. Original photos used on this blog are the property of its blog authors. Please contact us beforehand if you wish to use any images. Thank you. Eggs in My Pocket . . . Photos and writings property of blog owners, unless otherwise noted. Powered by Blogger.